The mining industry takes a heavy toll on pipes. The highly corrosive nature of much of the material means that moving it around the site and processing plant requires heavy duty piping. However these pipes run into a problem in particular their joints - the points where they are their weakest. Added to this the issue of pipe change outs and it becomes clear that miners need an adaptive coupling able to be quickly changed out yet at the same time still stand up to the harsh environment of the mine site. With this in focus, Victaulic have developed a new style 171 composite pipe coupling. Launching the product - which has been developed for Australian customers - at the International Desalination Association (IDA) world congress, Victaulic says the Style 171 engineered composite coupling "is perfect for use where corrosive conditions exist and is ideal for reverse osmosis (RO) skids in vertical and horizontal installations". It features installation-ready technology,which allows for quick and simple installation of the coupling, providing substantial gains in productivity. Its design offers greater corrosion and UV resistance, and means it is lighter in weight than ductile iron and stainless steel couplings. 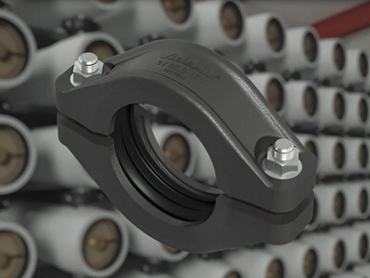 The Style 171 coupling does not require disassembly prior to installation; it is simply pushed onto the pipe end as a fully assembled unit and tightened using standard hand tools. "We’re excited to launch the Style 171 for our Australian customers,” Dave Sharkey, Victaulic's vice president for Australia, New Zealand and South East Asia stated. "As a flexible joint, the Style 171 accommodates expansion, contraction and deflection in the piping system. "The coupling’s design reduces time required to complete system installation, eliminates loose components that could be dropped or lost, and reduces installation clearance requirements." The Style 171 coupling is available in 1½ to 4-inch (40 to 100 millimeter) sizes and joins standard roll- or cut-grooved PVC and cut-grooved HDPE pipe. It can withstand pressures of up to 150 psi (1,034 kPa) and is supplied with the new Victaulic Grade 'E2' EPDM gasket, and is suitable for operating temperatures of 1 to 54 degrees Celsius.